Then she said the words I love to hear from my daughter: “I’ve got an idea I want to talk to you about.” She had been trying to be more grateful in her life, and wanted to make little cards and share them on the internet. As I move into doing more learning and teaching in the more, shall we say, spiritual-woo-woo aspects of life, I often share some new insight or practice with Veronica. Often she is interested, but sometimes I worry this just becomes another form of mom-nagging. So it was thrilling to hear her talk about her desire to be more grateful, her struggles with how to actually make that happen and her very creative solution. Now, those three weeks have slipped away from us in a blur of family meals and late night movies and family trips and cards games and discussion everything under the sun. 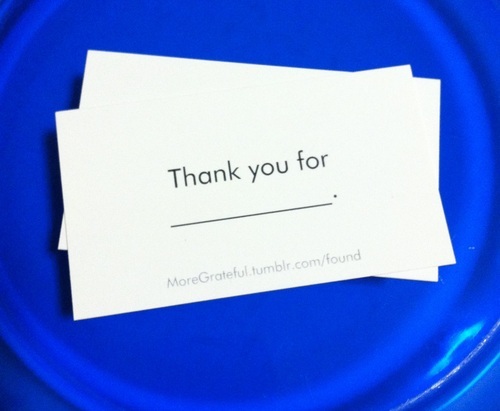 And in our last hours together for probably another year, we are putting the finishing touches on More Grateful, a tumblr where you can get these simple “Thank you for ______.” cards. But most importantly, you can share what you are grateful for and how you use the cards (give them away, use them are reminders, place them on a makeshift altar) to become more grateful. I have been developing a gratitude practice for a couple of years now. I got the idea from a friend who is recovery and it seemed to mean so much to him and help him with his process I decided to give it a try. As an enneagram type 6, I wrestle with anxiety. A stressful job followed by an even more stressful unemployment led me into a habit of starting the day rehearsing all the things that might go wrong that day. The feeling of dread that fostered often followed me through the day. My gratitude practice was not elegant in the beginning: after the alarm went off I would make myself lay in bed until I could name five things I was grateful for. Five things. They could even be the same five things they had been the day before. But there had to be five. And although at the start of each recitation I wasn’t sure I could get to five, I always did and it always made me feel better. My practice now is no more elegant than it was, but it is expanding a little. I am trying to make “Thank you” an automatic response to people in the business and work settling and even more importantly in my personal relationships. More importantly (and harder), when I feel anxiety creep up, rather than try to talk myself out of my fears, I shift the focus on what I am thank for for. Right now, I am at a crossroads, things are about to happen, but have not happened yet and frankly are not happening nearly a quickly as I would like. It’s a situation that can send my anxiety skyrocketing: I feel driven to do something, anything, to move things along, but often there is nothing to do. And least nothing constructive. Now, instead of ranking about how things *should* be, or winding myself up with nervous busy work, I take a breath and give thanks for possibilities, for things happening despite me, for things as yet unseen. Please take a look at More Grateful. Get some cards if you are so inclined. Share your gratitude practice. If nothing else, see why one of the first things on list every morning is my amazing daughter. This entry was tagged Enneagram, Fear, gratitude, Practice. Bookmark the permalink. Hooray for spiritual woo woo!